Some sad news. After two weeks of illness, we had to put Akhi down today. Akhi was short for ‘Akhdar’, the Arabic word for ‘green’ owing to her emerald-coloured eyes. 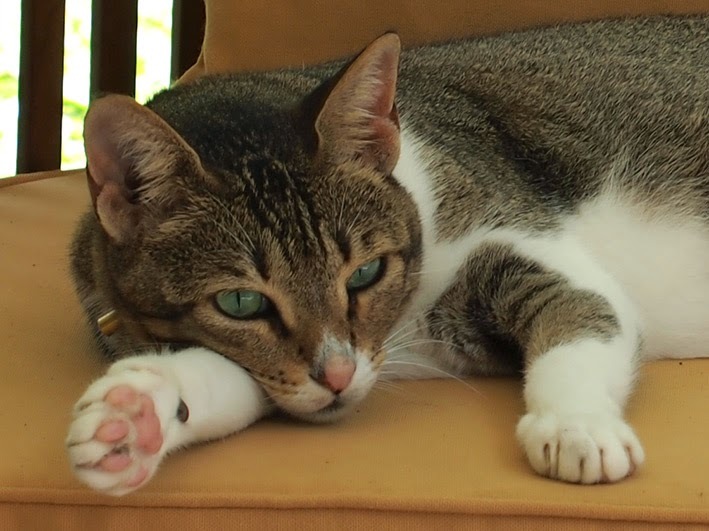 She was a street cat in Muscat who wandered into our garden one day to tuck into a few curried prawns, which was her favourite type of food, although she did like a nice piece of fish from the market on a weekend. She became my best chum (Mrs M has reminded me I mean second best chum). The only other friend she had was a cat called ‘Cabbage’ who she left when we moved to Singapore. She did not get on with 'Scabby Puss', another intruder in our garden in Muscat. We had breakfast and watched rubbish TV in the morning before work, she helped Mrs M with lunch (as long as it wasn't frittata), we’d play ‘don’t whack my bottom’ when I got home, and we would watch rubbish TV together in the evening before she got super-skitty and lacerated any unprotected flesh. We came away from the vet with only a collar, but lots of wonderful memories. Sorry to hear about Green, she was lovely.